Very rare and early 2000ad art by acclaimed artist Brian Lewis used as a Back Cover on 2000ad prog 81, 9th September 1978. 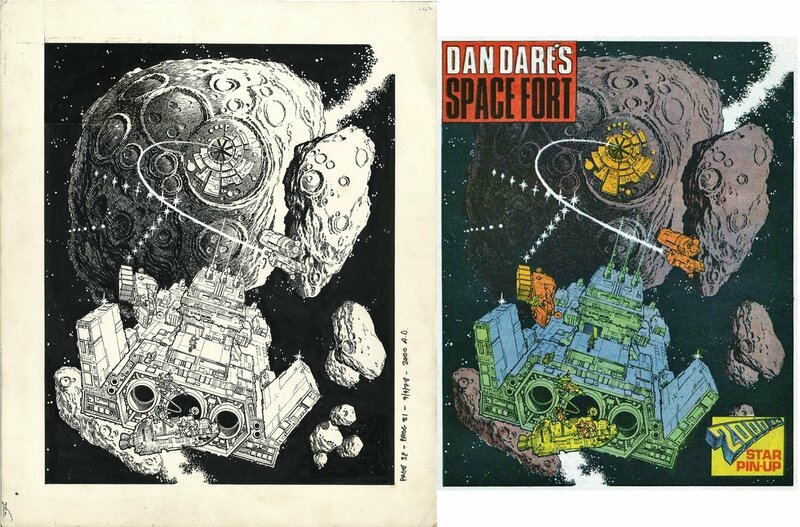 Brian illustrated DAN DARE - 'NIGHTMARE PLANET' in 2000ad Prog 61-63, and this was originally intended as the cover for Prog 62 ( hence the large are around the moon for the logo and title to cover ). It went unused as they bumped forward 'Death planet' in to Prog 62, a new short series, and Brian was instead commissioned to do that cover as well. The original cover was then used later on as back cover pin up in Prog 81! Brian was famous for his 60s sci fi cover art, and his work on Captain Condor (amongst others! ) His work was cut short by his untimely death in December 1978, so this was some of his last professional comic art. Art is on CS-10 art board, 36 by 48 cm. in good condition.